Dogs and cats often respond to commands when you offer treats. Dogs and cats sometimes engage in behavior that their humans don't like or find troublesome. Both species respond better to positive responses than to punishment, and fortunately you can draw on an array of modification tools to encourage the kind of behavior you want from your pet. Positive reinforcement, also known as reward-based training, can be an excellent tool for changing your pet’s behavior. When the animal does what you want, you provide a reward—a treat, praise or anything else that motivates her. When she doesn’t obey, you simply ignore her. Most pets dislike that, so they do whatever will result in attention. Cats can be more difficult to train than dogs, because they’re usually more independent and you may have a harder time finding the right incentive. But if you’re patient and persistent, you should be able to modify your cat’s behavior using positive reinforcement. Clicker training expands on the idea of positive reinforcement. You can use a clicker designed for this type of training or something like a clicking pen that you already have in the house. When your pet does what you want, you immediately click and give him a treat. Eventually, he should associate the click with the reward and perform the desired behavior when he hears the click. 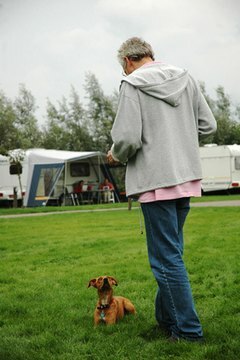 You need to repeat the training enough for your pet to learn what you want, and don’t exhaust him with long sessions. Altering your pet’s surroundings can be an effective tool for preventing unwanted behavior. For example, if your dog likes to drink from the toilet, leave the toilet lid down or close the bathroom door to resolve the problem. If your cat jumps on the kitchen counters, put down tinfoil or double-sided tape; cats hate stepping on either of those. Some behaviors are natural for dogs and cats. You might not be able to change them, and trying could take far more time and energy than you want to spend. Dogs and cats both like to chew. Cats scratch furniture and climb curtains, while dogs chew your shoes and run circles around your house. Rather than trying to change the animal's behavior, find other ways to satisfy these natural urges. Take your dog on on daily jogs or to the dog park so she gets exercise. Give your cat a scratching post to sharpen his claws and a cat tree he can climb. If nothing else works in changing your pet's behavior, you might need to consult a professional behaviorist. Your vet should be able to suggest someone reputable in your city or area. Make sure this person has the appropriate training—he should be either a Certified Applied Animal Behaviorist (CAAB or ACAAB) or a veterinary behaviorist (Dip ACVB). Another option your vet might suggest is medication. Antidepressants and antianxiety meds can help control symptoms, such as nervousness and agitation, that could be preventing your pet from responding to behavior-modification training. What Causes a Cat to Pull Out Its Fur & What You Can Do to Stop It? Why Does a Dog Chew on His Tail? Do Dogs Misbehave Because of Other Dogs? Why Do Cats Eat Rubber Bands? Will Mother Cats Attack Dogs to Protect Their Kittens?